Refine the appearance of your skin with Real Chemistry Luminous 3 Minute Peel, an exfoliating face peel that expertly removes dead skin to reveal a soft and renewed complexion. Its blend of ingredients work into skin, activating and combining with natural proteins to help lift away dead skin and reveal a brighter, more illuminated face and neck. 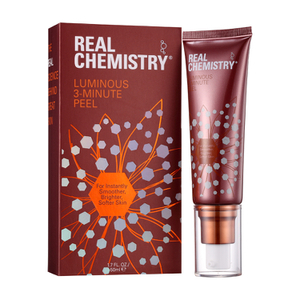 The non-irritating peel leaves skin feeling soft, radiant and resurfaced after just one use.